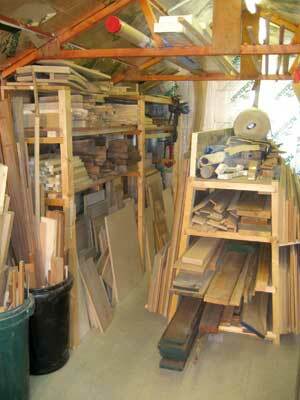 The one thing that most woodworkers do not have enough of is space. 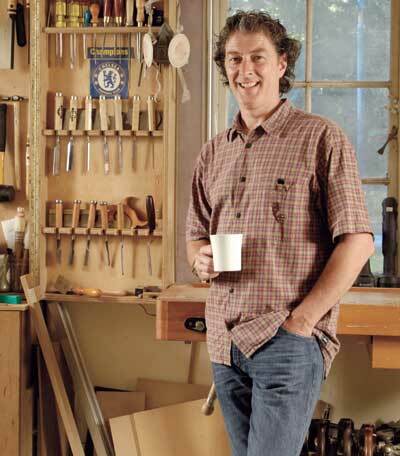 My workshop is 28 x 20ft and when I first started out as a furniture maker this seemed like plenty, but as time has passed, and I accumulated 'stuff', it seemed to become smaller and smaller. Buying more machinery didn't help because the real problem lay in my reluctance to get rid of any piece of wood in case it came in handy. 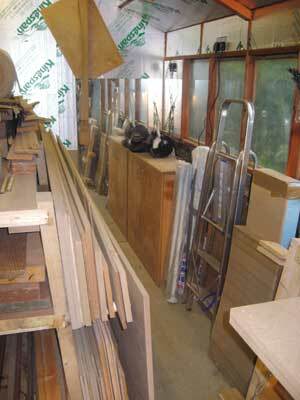 As a consequence, offcuts had been piling up, taking up valuable work surface space. Slabs of veneered MDF in various shapes and sizes were slowly encroaching and the walls appeared to be coming in at me until the workshop became a miserable space to be in. With obstacles threatening to trip me up and piles of timber precariously waiting to be knocked over, it was also a dangerous place to be. In addition to all of this, I realised that I was spending a good deal of my day moving offcuts from one part of the workshop so as to use a machine. The bandsaw for example had been a lovely place to both stack wood and lean wood against, and as a result it virtually disappeared from view. When it was required, I would be forced either to wander off to find another temporary home for these offcuts or select a different and often less appropriate machine for the job. Neither outcome was satisfactory. How lovely it would be simply to approach a piece of machinery and use it. Either I had to change my feelings towards these small pieces of wood or find somewhere else for them to live. I began to research garden sheds. I don't have a big garden but the building had to be large enough to accommodate all the offcuts and maybe a smaller machine or two. 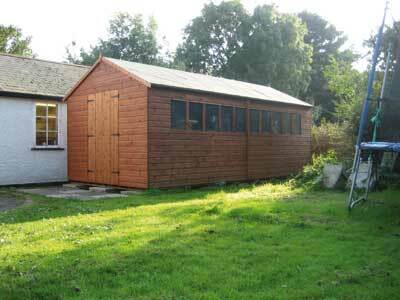 I found a 20 x 10ft shed for Â£1,150 and decided it was The One. I met with resistance from my nine-year-old who realised that a large shed would encroach into his 'football pitch', but I placated him by promising him his own workbench, to which he agreed as long as it had its very own vice. Erection of the shed was straightforward, the first step being to create a level base on which to build it - I was delighted when one of the lads volunteered to help. First, we put down a breathable membrane to help keep the weeds at bay, then followed the paving slabs onto which were placed eight 4 x 2in pressure-treated bearers. 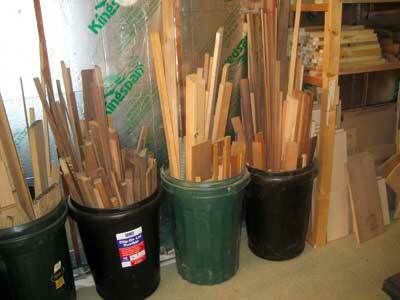 These would allow the weight of the shed, along with its contents, to be evenly distributed. On top of the bearers we placed a damp-course membrane. It took a day for three of us to assemble the shed, and the roof received its felt the next morning. The whole thing then had two coats of creosote, inside and out, which I am now regretting since it's four weeks on and the smell is still overpowering. 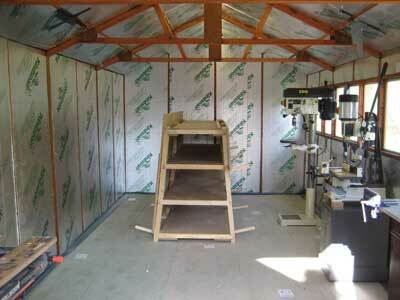 I put down some damp-course sheeting and then laid a 19mm moisture-resistant chipboard floor in about an hour. My electrician made a lovely job of wiring in four fluorescent lights as well as five double-plug sockets. This means that I can move all the battery chargers to the shed and also set up the Tormek grinder on my little lad's bench! I decided to insulate the walls and ceiling with 40mm Thermapitch, the idea being that it should keep the shed slightly cooler in the summer and slightly warmer in the winter. I do not have much solid material stored away, preferring to buy what I need as and when I need it, but I do usually have a dozen or so boards knocking around, and it would be heartbreaking to witness what I suspect might happen to them as a result of the extreme temperature changes that would certainly take place. Only time will tell if I have succeeded but for now at least I am delighted with the extra space. Because it wouldn't be sensible to have too much weight leaning directly against the walls of the shed I decided on an A-frame shelving system which would enable solid planks to be stored in the middle and full or half sheets of MDF leant on the outside. I made three frames from some 4 x 2in sawn pine I had lying around, which I had known would come in handy one day. I set the sliding compound mitre saw to a 5 degree angle and used it to cut the sides to length and also to cut the housings to accept the rails. The three frames were linked to one another with offcuts of MDF, and some 35mm dowel was inserted for the sheet material to sit on. I am really pleased with the result - lots of storage in a relatively small space. I then built a shelving system to store smaller offcuts of solid timber, and also to provide a place to stand the small MDF slabs that I had been trying to avoid bumping into for such a long time, again made from sawn 4 x 2in softwood and, again, involving fairly rough joinery; the only real concern was, once more, ensuring that nothing was leaning directly on the shed walls. My workshop is back to its original size. 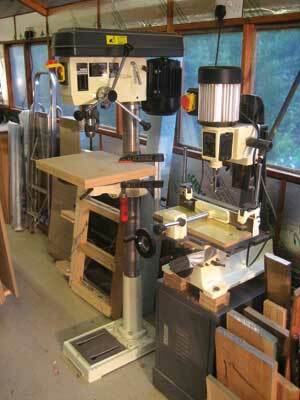 I have managed to find room for the pillar drill and mortise machine in the shed as these are not used every day. I can now walk to the bandsaw, the tablesaw, the planer thicknesser or the mitre saw and use them without having to move anything first. I have built three workbenches for students to use and a new making table which was long overdue. The benches are all made from birch ply, the legs are just two pieces glued, biscuit-jointed and screwed together to form a corner. The legs are then joined to one another with a brace at the top and somewhere near the bottom with more plywood, and a plywood top is then screwed on. These were then secured to the wall. The making table was built the same way but it has a 10mm overhang all round to accommodate future clamping needs. These benches/tables are very simple and quick to build - it took me longer to install the vices - but very strong. When I look into the shed and see what is in there, it is hard to believe that all of that once lived in the workshop. It has made such a difference and I am only sorry that I didn't do it sooner. "My electrician made a lovely job of wiring in four fluorescent lights as well as five double-plug sockets"